Lastly, I just want to thank Diana (from the bottom of my heart) for page 117. Got it in one! 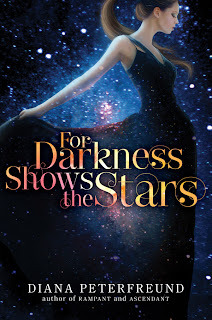 For Darkness Shows the Stars is due out June 12th. Angie!!!!!!!! WHY WHY MUST YOU DO THIS TO ME? Ana, LOL. I swear I wasn't trying to make your life harder! I just . . . really enjoyed this book. This sounds magical. Why can't June be here sooner!? Sandy, that's a good word for it. It just felt lighter than air and just as essential. I just can't wait to get and read this book. Sabrina, I can't wait to hear what you think. I want to read it so bad! I love Persuasion! Thank you for review. I can't wait for this book, even though waiting for it is going to be a lot harder now. StoryLover, my pleasure. And I really am sorry to make the wait harder! I am beyond jealous but very happy to hear that it is as wonderful as you thought it would be. It's mine as soon as it hits the shelf! Laura, here's to Jane and everything she inspires! This does sound good! I admit PERSUASION is not my favourite Austen, but I may have to re-read it before June. Li, here's the thing about this book. It's gonna work for people who didn't necessarily love PERSUASION, imo, because of its great worldbuilding and the uniqueness of this take on the story. I wouldn't even say a re-read is required to enjoy it. But it definitely serves as a love letter to anyone who loves Austen. I am dying. DYING. Persuasion is a favorite of mine, and I've been salivating over this book as it is. After reading the first paragraph of your review, I stopped and emailed the pub to beg for an ARC. haha. Allie, LOL. Hope a copy arrives soon! Jolie, oh, awesome! Yeah, this one is likely to be right in your wheelhouse. Oh, I'm so jealous. Want, want, want! Kerry, hehe. I know the feeling. I am so, so excited for this one! Persuasion is my favorite Austen (so far, since I've only read this, P&P and Emma) and this remake just makes me so happy. I can't wait to get my hands on this. Tina, then you are definitely not going to want to miss this one. I keep coming back to that cover, too. So pretty. I hadn't even heard of this and now I can't wait to read it. I've always loved Anne Elliot, who lost her bloom. Livi, ooh. Glad I could spread the word. This Elliot is a winner as well. I read the FIRST PARAGRAPH of your review and had to stop. I was ready to bite my fist in want. Seriously, I'm SO GLAD I just won an ARC now. As soon as it's in my grubby hands, I will be able to finish this review without making some sort of strange noise. I really want to read this one, in case you couldn't tell. P.S. I adore the pink you use in your blog now for the quoted bits. Janice, LOL. I was so stoked to see your name listed as the ARC winner! Can't wait to hear what you think. Glad the pink is workin' for you. I wasn't sure, but liked the look. You know you are killing us, right? Ari, oh dear. I know I am. I am sorry to cause pain. Truly. I was incredibly excited for this book when I first heard of it, then promptly forgot about it until I saw someone mention it on Twitter a few weeks ago. Now I'm excited again. Elliot seems to be a lot more confrontational than Austen's Anne, judging from the excerpt. Melanie, oh good. It deserves to meet with some excitement, I think. This Elliot is a true descendant of the original Anne. I am partial to her more forward scenes, and may have featured them here. But she's true to the original in so many ways as well. I'd grab a copy and read it right now if it has already been released. :) I love that it's a standalone novel because I still haven't read any of Diana Peterfreund's books (I know, I know). Lovely review, as always, Angie! You've convinced all of us to read this ASAP. Chach, hooray for standalones, right?! his is such a wonderful review Angie, it made me even more desperate to read this! 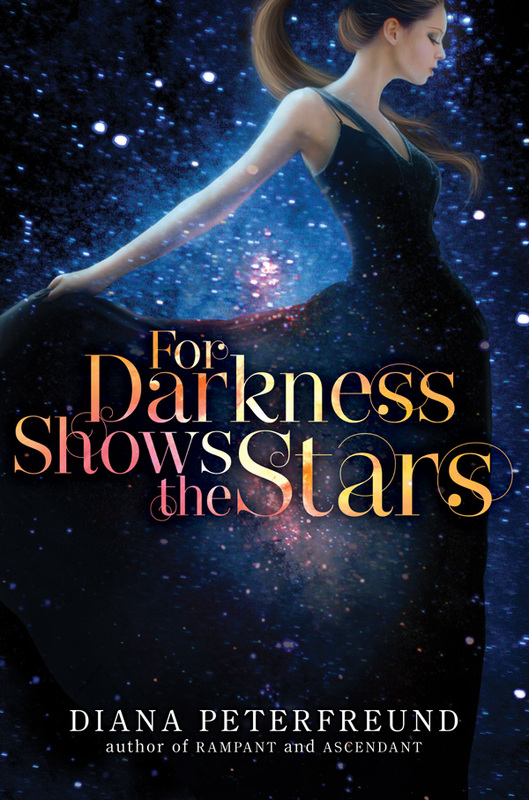 I can not wait to meet Elliot and Kai and fall headlong into this book. I'm so excited! I know it is going to be a read through the night one! Also, YES! I sometimes have a book in my hands and don't start it. Love that anticipatory feeling, but also knowing I can start anytime. Alexa, thank you! Makes me happy I'm not the only one who literally holds onto brand new books for a little while. My heart was in my throat reading this review thinking 'it can't really be everything I hoped, can it?' and finding out that, yes, at least for Angie, it can! I am so so excited for this book, I cannot put it into words, and the relief I feel at reading your thoughts fills me with hope that I will not be disappointed. I feel like I'm going to have to pick up Persuasion for a re-read now to tide me over! I didn't reread PERSUASION beforehand, so I'm not sure how they'd feel back-to-back. But all the important echoes were there for me. I SO want this book! It kills me to have to wait for it. Lin, ack. The waiting game is excruciating sometimes. Here's to summer arriving soon! Willow, lol. Yeah, you should definitely read it. I personally think FDStS can stand just fine on its own, but it is wonderful to be able to savor the similarities if you go into it already familiar with PERSUASION. So I'd probably opt for reading it first. THIS: "I may have been predisposed to like Elliot, but the way my heart launched itself into my throat when hers did, the way my temper rose on her behalf, and the way I held my breath at her restraint and cheered her adamant refusal to be downtrodden . . . I more-than-liked Elliot." Now that I've read it myself... YES. Cecelia, *highfive*! SO glad you more-than-liked her, too. I DEVOURED THIS BOOK (oh, by the way, this is Kate & Zena, the one that traveled from The Book Smugglers. There is only ONE OF ME. At least, last time I checked.) 10 hours is how long it took me to finish this book. And Elliot, I loved her. I loved how flawed she was over Tatiana. I loved how she hung all of Kai's gliders above his room in the barn. That was one of those parts when I nearly cried. She couldn't bare to throw them away so she hung them. By the way, what happened on page 117 again? Was the will part? I'm not one of those people who read by numbers. When a book is so good, I get the whole movie-theatre-sensory-theatre thing going on. I guess I'm not really "reading," I'm "watching a book."